Many Networx readers will be putting up some form of Christmas tree in the coming days or weeks, and while there are lots of alternatives to the traditional cut conifer, these holiday classics still dominate the landscape. The only problem is what happens at the end of the Christmas season, when that once-proud tree is a brown, dessicated remainder of its former self, and you have to drag it out of the house, shedding needles along the way, and send it along on the next step to its journey. City streets in late December are commonly bedecked with cast-off Christmas trees waiting mournfully for collection, and some cities actually set up Christmas tree collection programs, specifying a collection day and sending around compost collection trucks to gather up the dead. But that doesn't have to be the fate of your Christmas tree, because there are many creative uses for its remains that offer a more dignified solution. Christmas trees are infamously flammable, especially at the end of their lives, when they have minimal moisture to suppress flames. While electricians may caution you about the use of some electrical components around a Christmas tree, you can turn that trait to your advantage once the holidays are over. Cut your tree into manageable portions and repurpose the branches and trunk as kindling and fire starter to quickly get flames going in the woodstove, firepit, or fireplace. Make sure all tinsel and ornaments have been removed to avoid noxious smoke. Be aware that if your tree is at all sappy, you run the risk of creosote buildup. It needs to be completely dry before being used in indoor fireplaces and woodstoves. Some families make an epic post-holiday tradition of creating a bonfire with their trees, and they may even combine forces with friends and other households in the family to make the fire last longer. Christmas trees light up like, well, Christmas trees, and they can make a great bonfire source for a New Year's party on the beach or in the backyard. As with any bonfire, check to determine if you need a burn permit first, and observe safety precautions: light the fire in a clear, open area on a day with minimal wind, don't keep flammable objects nearby, and supervise the tree closely as it burns. Those obnoxious shedding needles make fantastic mulch for your garden, and the branches can be composted in the brown layer of your compost. If you have access to a wood chipper, run the trunk and large branches through to create wood chips, which can be used for mulching, lining paths, or suppressing weed growth. Your local Los Angeles landscaping company may be happy to mulch your tree for a small fee. Cut that trunk into miniature rounds and use them in upright position to edge paths (or beds and other garden features). If you have a somewhat folksy, natural, relaxed-feeling garden, they'll fit right in. They'll also break down slowly to nourish the soil and slowly improve the condition of your garden beds, which is a nice added feature. Incidentally, those same rounds can also be sanded and sealed to make coasters. A trunk with most of the branches trimmed away can create a natural trellis, while leftover branches can be used as a free source of garden stakes. They make be crooked, but that can add to the charn in a garden where more formal straight stakes would look out of place. Overwintering fish need places to hide from predators and get out of the coldest parts of the water. That's where tree branches come in. In nature, branches may naturally fall into ponds, rivers, and streams to create habitat, but in more manicured water features, fish typically have fewer options to choose from. Adding branches from old Christmas trees can help keep fish safe through the winter months. Admit it: your cats have probably already been climbing the Christmas tree, so why not make the arrangement formal? Trim away most of the branches, leaving large and sturdy ones in place as braces for scrap wood from construction sites or the hardware store. 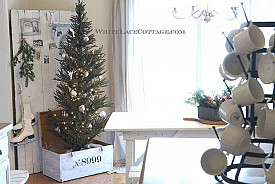 Screw the wood down tightly so it won't wobble before you upholster with scrap carpet or other material (consider wrapping some parts of the trunk in coarse rope for the cats to scratch) and set the tree up on a stable base. Birds and other animals love suet, especially in the winter months, when food sources are limited. Trim the tree down and drill out the trunk so you can insert suet, bird seed, and other treats. Your old tree will provide you with some great birdwatching! Here's a surprising use you might not have heard of: Christmas trees are sometimes anchored in place on beaches to trap sand to slowly rebuild damaged dunes and banks. As the sand builds up, it slowly covers the tree, and conservation organizations can plant dune grasses to hold the sand down. If you're interested in seeing your tree go to a good cause, contact the government agency or conservation group working on beach and dune maintenance in your area to see whether they can use your tree. Finally, yes, you can always recycle your tree. Contact your municipal waste agency to see if they have a citywide tree pickup day, accept curbside trees, or expect people to bring their trees to a recycling lot. Some charities collect trees after Christmas and bring them to a central recycling facility, and you may also be able to drop your tree off at a locale like Home Depot. Before sending your tree for recycling, please remember to remove ornaments, tinsel, and other decorations that could interfere with processing it.